As workplace retirement plans keep shifting investment decisions to employees, a throwback to traditional pensions is gaining popularity with corporate sponsors of 401(k) and 403(b) plans. Meanwhile, employer contributions rose at a 30% rate from the previous year, estimates Dan Kravitz, whose firm was recently bought by retirement plan record-keeper Ascensus. His research also finds that assets held in CBPs surpassed the $1 trillion threshold for a second-straight year. "From the data we monitor, traditional pension plans are definitely in a state of decline -- the costs of maintaining these as primary retirement savings programs have just gotten too expensive for most companies to afford," says Kravitz. Referred to as defined benefit plans, traditional pensions require employers to handle investment decisions for plan participants. Employers are also responsible for making all contributions to the plan. As a result, a certain guaranteed level of income to participants is assured. By contrast, defined contribution plans -- such as 401(k) and 403(b) savings platforms -- provide fund choices but leave most investment decisions to participants. Also, individual workers typically fund at least some of those benefits through their own salary deferrals. The balance is made up by matching contributions as well as any discretionary profit sharing money thrown into the retirement pot by an employer. In CBPs, employers are able to take advantage of existing tax rules to fund new and separate accounts for each participant, points out Kravitz. "What really makes these types of tax-advantaged accounts attractive to both employers and employees is that they can be funded over-and-above what's being contributed to an existing 401(k) plan," he says. Since CBPs are characterized by the IRS as a type of defined benefits plan, Kravitz notes that employers are still responsible for making contributions. Those can surpass $300,000 a year per participant, he says, depending on that person's age and role within a company's hierarchy. In a 401(k) plan, 2018 benefits are typically capped at $61,000 for a participant aged 50 or older. This includes individual contributions, employer matches and profit sharing. For younger investors, that amount is $55,000. 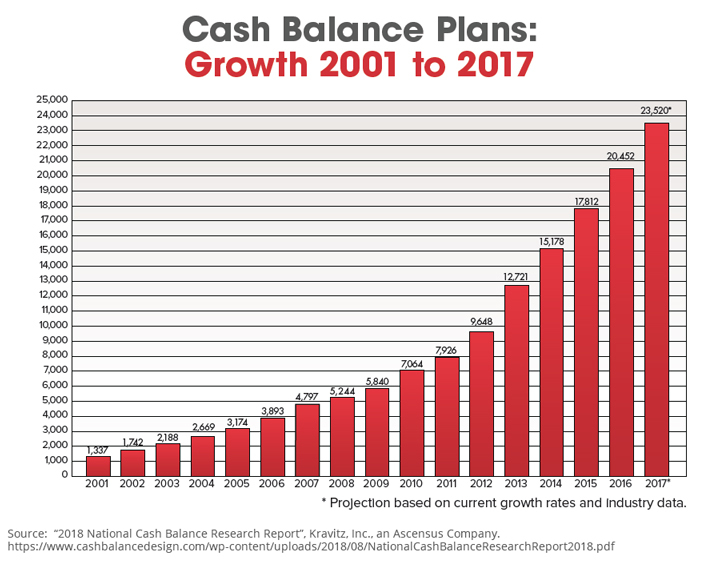 "We really see cash balance plans coming into play when business owners decide they’d like to defer taxes on more of their retirement savings than what’s normally allowed in a 401(k) plan," says Jim Norman, a cash balance plan expert at Laguna Hills, Calif.-based third-party administrator Economic Group Pension Services. The cost of covering employees in a 401(k) profit sharing plan is typically going to require that owners contribute at least 4.5% of their rank-and-file employees' pay who are eligible to participate, he adds. "But if we add cash balance plans into the mix,” says Norman, “contributions can go up for everyone in a very cost-effective manner." As might be expected, government filings indicate that CBP benefits are skewed to higher-earning owners and top executives. But federal regulations require employers to test their retirement plans to make sure benefits as a percentage of pay are being distributed in a fair manner, notes Norman. "We often see contribution rates increase by two- to three-times for rank-and-file employees when their employers implement CBPs to go along with a standalone 401(k) plan," he says. The new tax reform act, which kicks in this year, is creating more buzz for CBPs, suggests Kravitz. That's because a new 20% tax deduction was created for "pass-through" businesses such as S-corporations, partnerships and sole proprietors. But in order for many business owners to fully qualify for the new deduction, taxable wages on the part of a married person filing jointly can't surpass $415,000 ($207,500 for single filers) this year, according to Kravitz.